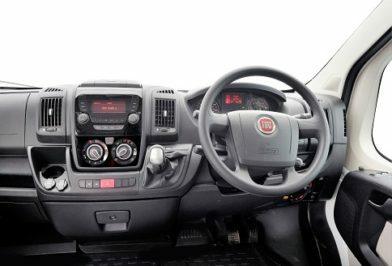 In fact, Auto-Sleeper Fiat comfort matic transmission is on a Fiat Ducato chassis cab and is available as an optional extra. The innovative Comfort-Matic 6-speed is referred to as a RG (robotised gearbox). It fact, it is now available in combination with the reliable 130 and 150 MultiJet engines. So, the Fiat Ducato has the 130bhp and a 150bhp comfort-matic gearbox and becomes optional on all Auto-Sleeper 2018 Peugeot models. Thus, providing the gearbox that ensures an easy, fuel-efficient drive and also has respect for the environment. There is a 130 option at £2,000 including vat and a 150 power option at £4,000 including vat. With the robotic operated principal, offering the strength and precision of a manual gearbox. However, with the ease of an automatic gearbox, making driving easy. Also, the Auto-Sleeper Fiat comfort matic comes with a number of special features, all designed specifically for motorhomes. With the Comfort-matic transmission, you are able to enjoy the driving experience and ease of use. The Auto-Sleeper comfort-matic gearbox is an innovative transmission and the advantages in its simplicity, fuel efficiency and performance, ideal for Auto-Sleeper customers who would like an automatic transmission. Therefore, an extremely interesting option for those who love leisure, such as motorhome and van conversion owners. In fact, gearbox meets the demands of all those customers interested in the specific features of automatic transmission. Most find the Fiat ducato gear selector easy to use. The Fiat Ducato is the leading motorhome owners choice and the comfort-matic gearbox provides an ideal solution. So, ideal for motorhomes and campervans on long or short journeys. In addition, right down to match the practical urban city delivery vans, city use. In fact, there has been great attention paid to adapting and customising the gearbox for recreational vehicles. Also, during the development stages extensive research was done. Both, in tuning and testing of the configurations of different surfaces, gross vehicle weights in typical motorhome conditions. In addition, to responding to the mobility needs of motorhome owners. So, easy to select there is a special UP button on the Comfort-Matic gearbox panel. Therefore, automatically optimising the gear shift points. Therefore, ensuring the most appropriate engine rpm is available in any conditions. Technically, the gearbox is known as an MTA (manual transmission automatic). So, the gearbox offers six speeds plus reverse all that work in fully automatic mode. Thus, with sequential use in manual mode with actuation. In manual mode, the driver can choose the ratio to engage by means of the ‘joystick’ (gear lever) mounted on the dashboard. So, this Fiat transmission is proving to be a very popular option. Maybe with more slow moving traffic and the simple way it handles in urban traffic. All aspects of using this transmission have made this a popular choice with Auto-Sleeper owners. How it operates. Please feel free to contact us and arrange to see our Auto-Sleeper range in the showroom here in Derby. Also, take a look at the other premium pack options and details here.